Staring at this picture long enough, I started hearing voices. Some came from the tomato, some apples. Discrimination doesn’t come with a sound or smell. It’s difficult to prove its existence. Some aren’t aware of been discriminated; some don’t know they discriminate. “Is it possible that you were oversensitive?” I asked my friend this question after he described how a guy, in a pretty empty elevator, asked him to push the floor-button for him. “Of course, it is possible,” he said. He looked into my eyes. It was clear to me that he didn’t tell me the whole story. I decided not to ask. The only time I was so sure that something wasn’t right was when I took my daughter and her friend to a local restaurant for lunch. We waited for a long time for our service person to show up. When she came, she had an expression that I could never forget. It was the same expression I saw on my daughter’s face many years ago when she spitted out the food I fed her. I ordered a cup of soup. It took forever for soup to come; when she came, she dropped the bowl on the table, making a disturbing noise. And the soup was cold. I smiled. “I think I know how I was treated more than you do,” I said and walked away. I never went back to that restaurant again. A week ago, I emailed my friend to apologize. I assured him that when I asked him whether he was oversensitive, I wasn’t questioning what he said. I wanted to make sure there wasn’t any misunderstanding; I wanted the truth. Truth may remain mystery in many cases, of course. Enjoyed the write up quite a bit Helen ~ the photo too, the shallow DOF works well, it emphasizes the thought of discrimination. Ha, ha, maybe that is why it struck such a great chord with me 🙂 Really a beautiful piece of writing, a story-within-a-story, which is powerful. The big problem Helen is that there are many truths…, have a nice week!!! 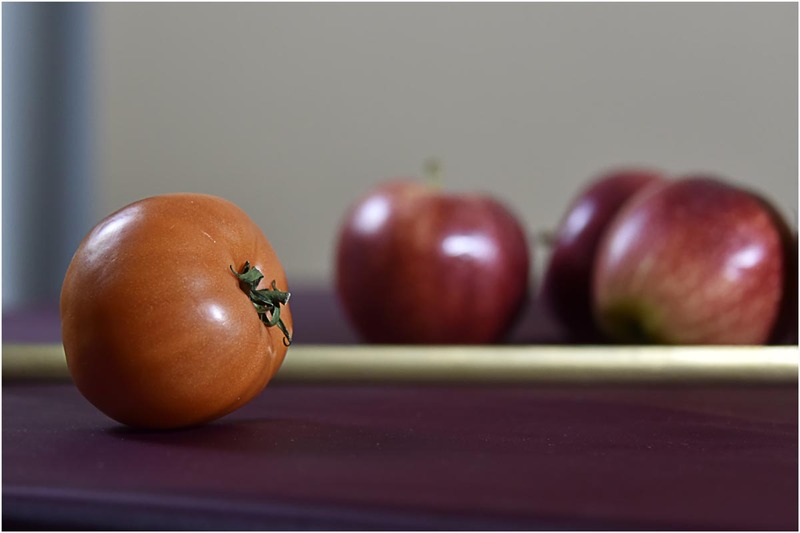 I love how your thoughts progress from a simple photo of a tomato and apples! (Simple meaning in subject, not in technique!) They are both fruit, both tasty, who’s to say one is better than the other? Your stories of discrimination make me sad. Thanks, Anabel. You are right – who’s to say one is better than the other. And I would add: even if one is better, we should still be able to live together peacefully. All these experiences didn’t bother me a lot. I felt discomfort, but I didn’t recognize what kind discomfort it was, so I didn’t think too much of it. 😉 Sometime being not-too-smart could be a blessing. Ha. thanks for sharing this…I need reminding about how subtle and painful discrimination is… I also find a need to apologize and somehow seek amends. Aha … the tomato and apple metaphor again. Those rotten …. I sometimes wonder how people can behave this way. I see it more of a jealousy. As a person of color and worked hard in Canada, by far, I got the job that most non-coloured people because I am worthy of it. It is jealousy. Hope the apology is accepted. Maybe there is another tomato-apple story coming, but I have to think through first. Ha. You are a courageous woman. If you didn’t write those articles, I probably wouldn’t write these. Thanks. Discrimination comes in many forms. Mutual respect is the key. Thanks you, LD. They said the ability of speaking/writing in a second language is the first thing to go when you age. They were right! When I wrote a reply saying even if it is true that some of us are better, we should still be able to treat each other nicely (something like that ;-), in my mind I was searching for the words “mutual respect”, but I couldn’t find them. I am so glad to read your comment! THANKS! I like your metaphor but I really feel as a parent first and foremost what we should teach our children is that no one is superior/inferior to others. This all idea of I/ME creates majority of the problems. I am sorry Helen but am not so sure about it. My personal opinion is these things are very complicated since you do not know the girl as such. We donot know the reason for her behaviour, is it just general hatred about others or it was in her upbringing or if she has suffered or what not. She didn’t deserve a tip, but you were gracious. I can’t believe that discrimination still happens in 2018. What’s wrong with us? What is another half of the story happening on your friend years ago? discrimination could be hidden in a very subtle emotion… as a teacher, sometimes I feel that this kid is smarter, and another is not… and I feel bad when I got this feeling. Thank you so much!! Yes, everybody deserves equal respect. I will always remember this! A new week starts… again. Have a beautiful day! Thanks, Julie. My feeling is that the chance for that girl to learn to respect others is very small. And that makes me sad.